The Hilltop Institute has just published a summary report of an assessment it conducted of four grant programs funded by the Maryland Community Health Resources Commission (CHRC). The mission of the CHRC is to increase access to care and build capacity among the state’s safety net providers. In spring 2016, the CHRC contracted with Hilltop to assess the programs of four selected 2016 grantees: Potomac Healthcare Foundation, Lower Shore Clinic, Garrett County Health Department, and Baltimore City Health Department. The objective of the assessment was to determine the extent to which the programs had an impact on health services utilization and costs for participating Medicaid beneficiaries. Hilltop’s summary report discusses the assessment methodology, limitations, and key findings. Read the report. Hilltop Special Advisor and former Executive Director John Kaelin has co-authored a Rockefeller Institute of Government issue brief titled Medicaid Buy-In: Questions of Purpose and Design. In the brief, Kaelin and co-author Katherine Hempstead of the Robert Wood Johnson Foundation discuss the idea of states using Medicaid as a platform for coverage expansion through Medicaid buy-in—initiatives that use part of the structure of the Medicaid program to open coverage, for a fee, to populations not usually eligible for Medicaid. The brief discusses three types of buy-ins and design issues that should be considered and concludes with a discussion of the use of Medicaid buy-in to address access to and affordability of health care. The Center for Mississippi Health Policy has commissioned The Hilltop Institute to estimate the costs to Mississippi Medicaid attributable to tobacco. Using the best available evidence from the research literature, Hilltop will identify conditions associated with tobacco use and the associated ICD-10 diagnosis codes to build a model for estimating tobacco-related costs for Mississippi Medicaid participants. The Hilltop Institute’s Advisory Board held its inaugural meeting on August 1, 2018, on the UMBC campus. Ten distinguished scholars, health sector executives, and clinicians were appointed to the Board by UMBC President Freeman A. Hrabowski, III and will provide counsel to Hilltop’s Executive Director, Cynthia Woodcock, on strategic direction to advance Hilltop’s mission. The Board will meet twice a year. Christopher Koller, president of the Milbank Memorial Fund, is the chair. Hilltop staff presented at the 2018 AcademyHealth Annual Research Meeting (ARM) in Seattle in June. The ARM is the gathering place for individuals leading the charge to transform delivery systems and health care in a rapidly changing landscape. Over the course of this three-day conference, more than 2,500 individual attendees work together to share and strengthen the evidence needed to inform the decisions that affect the health of individuals and communities. Senior Policy Analyst Shamis Mohamoud, MA, gave a podium presentation, Evaluation of the Maryland Health Home Program for Medicaid Enrollees with Severe Mental Illnesses or Opioid Substance Use Disorder and Risk of Additional Chronic Conditions. Policy Analyst MaryAnn Mood, MA, presented a poster titled Community First Choice Implementation in Maryland, 2014-2016. To view the presentations, click on the titles. A study in the April 2018 issue of the Journal of Health Politics, Policy, and Law investigated the relationship between state regulatory requirements and hospital community benefit expenditures using The Hilltop Institute’s online resource, the Community Benefit State Law Profiles and Internal Revenue Service data. On Tuesday, November 28, Hilltop Senior Programmer and UMBC Public Policy PhD candidate Jennifer Kitlas Smith, MPH, gave the 2017 Judith A. Shinogle Memorial Award lecture at UMBC. Smith discussed her dissertation research, which focuses on the comparative effectiveness of two asthma treatments—medication administered by inhaler vs. medication administered orally. Colleagues from Hilltop and UMBC’s School of Public Policy, faculty mentors, community leaders, friends, and family members joined Smith to celebrate her achievement. The award was established by Shinogle’s family in her memory to provide encouragement for UMBC Public Policy doctoral students committed to health policy research. 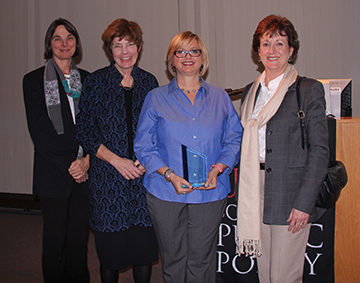 Smith was selected by a faculty committee in recognition of her outstanding scholarship and research in health policy. At Hilltop, she performs SAS programming using Medicare, Medicaid, Maryland hospital data, and the Maryland All-Payer Database to assess quality, cost, and utilization patterns for the Medicaid/Exchange churn population, mental health, substance abuse, and dual eligible populations in order to analyze large health care data sets for quality of care, outcome measurement studies, and program assessment. Hilltop is pleased to announce the addition of two new senior directors: Jim Clavin, MBA, Chief Technology and Compliance Officer, and Alice Middleton, JD, Chief of Staff. Hilltop staff made several presentations at the 2017 AcademyHealth Annual Research Meeting (ARM) in New Orleans. Hilltop staff presented posters at the State Health Research and Policy Interest Group Meeting on June 24. Senior Policy Analyst Charles Betley, MA, presented a poster titled Estimating State-Specific Costs of Medicaid Adult Dental Coverage Expansion Using Comparative State Data; Policy Analyst Jamie John, MPH, presented a poster titled Service Utilization and Expenditures among Adults with Diabetes in Maryland’s Medicaid Managed Care Program; and Policy Analyst MaryAnn Mood, MA, presented a poster titled Using Geocoding to Validate HCBS Provider Self-Assessments. In addition, Charles Betley delivered a short podium presentation on the poster above at a poster symposium at the main meeting on June 26. Finally, Director of Special Research Studies Michael T. Abrams, MPH, was a co-author of a poster presented at the main meeting on June 26 titled Promoting Entry into Evidence-Based Supported Employment in Maryland’s Statewide Public Program: A Population-Based Empirical Analysis. To view the presentations, click on the titles. Hilltop Director of Special Research Studies Michael T. Abrams, MPH, PhD, and University of Maryland Baltimore (UMB) School of Pharmacy Professor Fadia T. Shaya, MPH, PhD, have won an Innovation Seed Grant from the UMB-UMBC Research and Innovation Partnership Grant Program for a project titled Prescription Opioid Exposure and Subsequent Opioid Dependence. Beginning July 1, 2017, for 15 months, Abrams and Shaya will use the $50,000 funding to conduct a case control study in a cohort of Maryland Medicaid adolescents and young adults aged 13 to 24 years to explore whether prior exposure to prescription opioids is associated with subsequent opioid dependence.